McGregor Manufacturing has built its reputation on providing customers with the highest quality machined parts. 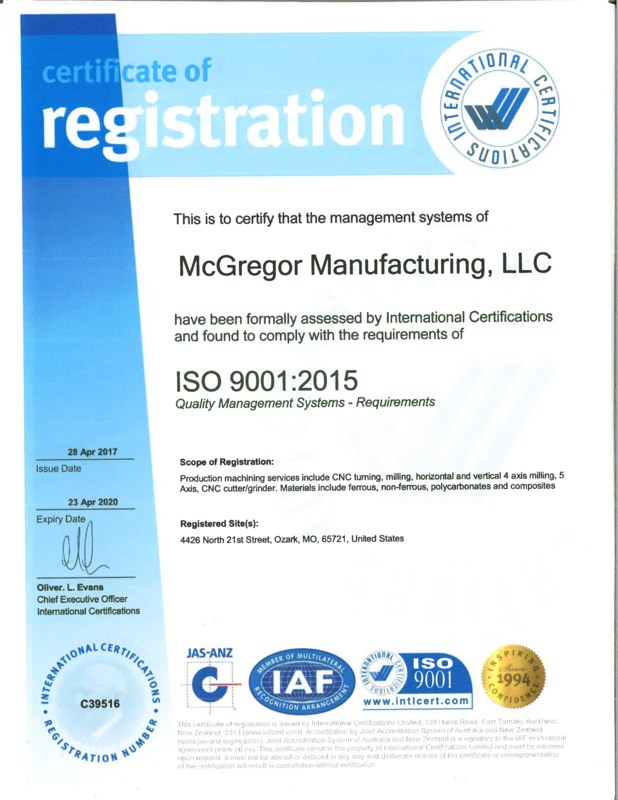 With the completion of ISO9001:2015 McGregor has taken the next step in ensuring consistent high quality machined parts. We are excited about this milestone and would love to share our experience and expertise with you.If you have any questions please click here to send an inquiry or to contact us directly. McGregor Manufacturing specializes in precision CNC production machining, using current machining and design software as well as the latest CNC equipment. McGregor Manufacturing offers products with close tolerances to within .0001. McGregor Manufacturing offers a variety of services: CNC turning; CNC milling; CNC horizontal; vertical 4 axis milling and CNC grinding services. Our material capabilities include: aluminum, brass, copper, plastic, stainless, steel, etc. Industries served: industrial printing, telecommunications, aircraft, medical, automotive and OEM manufacturing.